Established in 1991, the Community Health Center of Meriden serves residents of the city of Meriden, as well as the surrounding communities of Wallingford, Cheshire, and Southington. 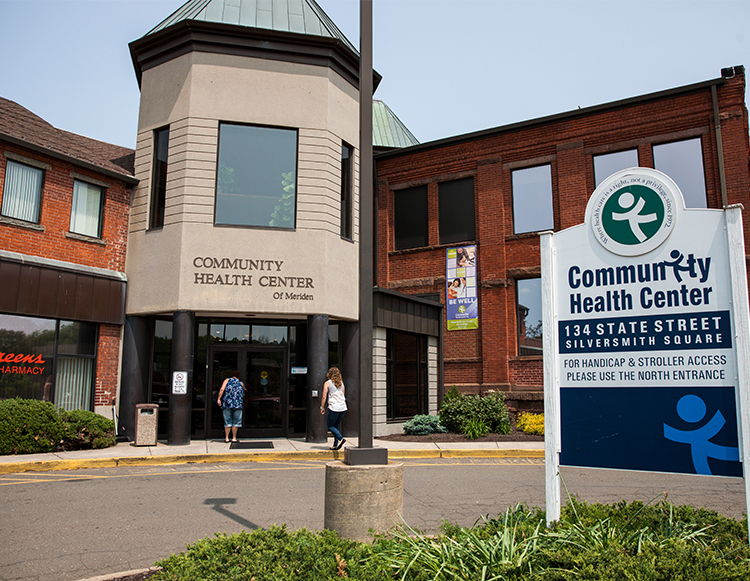 The CHC of Meriden serves as the hub for many CHC services, including its behavioral health services in all city schools, mobile dentistry programs, and healthcare for the homeless services in the city’s homeless and domestic violence shelters. If you have a Dental appointment, you'll be seen at our Dental clinic. Directions available here. There are two lots available for patient parking. To the right of the building is Handicap and Stork Parking (for pregnant patients). The main patient lot is to the left of the building on State St.
Brenda Beauchamp, PsyD: Ponce Health Sciences University. Residency: Community Health Center, Inc.
Clifford Briggie, LCSW, PsyD – BA & MSW: University of Connecticut School of Social Work. Jennifer Bumpus, LCSW, MSW: University of Connecticut School of Social Work. PsyD: Antioch University New England. Residency: Community Health Center, Inc.
Meghan Constantino, CNM – BSN & MSN: Yale University Health Plan. Amma Darko, DNP, Duke University. BSN: Southern Connecticut State University. MSN: Yale University. Richard Feuer, MD – BS: Brooklyn College. MD: State University of New York. Residency: Yale University School of Medicine. Angelica Furtado, LCSW – BA: Lee University. MSW: Simmons College. Michelle Gauthier, APRN – BA: Quinnipiac University. MSN: Yale University School of Nursing. Faraj Ghabag, MD – MD: Al-Arab Medical University. Residency: St. Vincent Mercy Medical Center. Marwan Haddad, MD – BA: Harvard University. MD: McGill University School of Medicine. Residency: University of Toronto. Scott Lindsay, DPM – BS: Drexel University. DPM: Pennsylvania College of Podiatric Medicine. Residency: Penn Presbyterian Medical Center. Jeannie McIntosh, APRN Resident – BA: Middlebury College. MSN: Yale University School of Nursing. Sara Nagot, LCSW – BA & MSW: Boston College. Sarah Norris, WHNP, MS, RN: University of California, San Francisco; BA: Connecticut College. Dipak Patel, DO – BS: Pennsylania State University. DO: New York College of Osteopathic Medicine. Residency: Peninsula Hospital Center. Anna Ramos, RD – BS & MS: University of Connecticut. Beth Roth, APRN, SEP. MSN: Yale School of Nursing. Tonya Smith, APRN – BA, BSN & MSN: University of Rochester. Katelyn Marie Sullivan, APRN – BSN: Fairfield University. MSN: Southern Connecticut State University. Daniel Wilensky, MD – BA & MD: University of Virginia. Residency: University of Connecticut Health Center. Andrew Yim, APRN – BA: Bowdoin College. MSN: Yale University School of Nursing.